The Return of the Whip and Fedora! According to boxofficemojo.com, Paramount Pictures has announced that there will be an INDIANA JONES 4 movie...to release May 2008! Spielberg, Lucas, Ford...and maybe Connery? It all sounds good. It even looks as though composer John Williams has signed onto the project. Sounds good....I think. 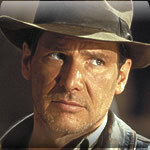 Still, is Harrison Ford too old to be the Indy we all know and love? Should John Williams give up the reigns as these type of films don't seem to be his cup 'o tea any longer?